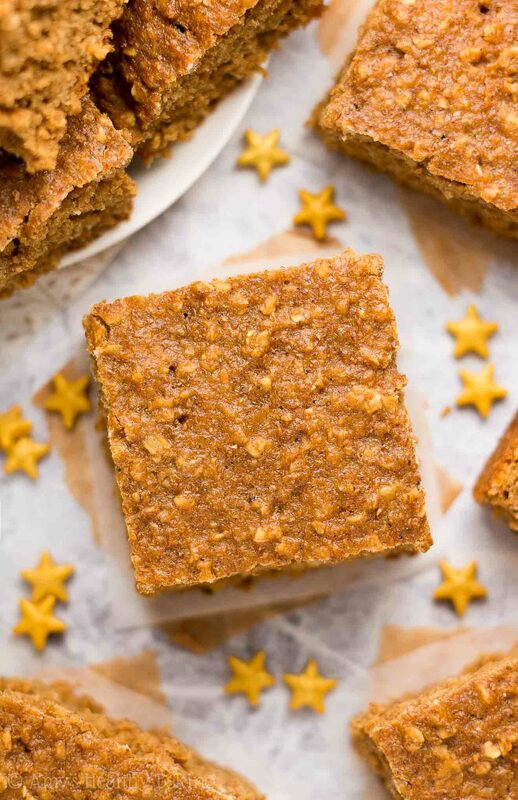 An easy recipe for a guilt-free snack cake full of hearty oats, cozy spices & festive gingerbread flavor! Only 101 calories with no refined flour or sugar! Click here to PIN the recipe and save it for later! Throughout elementary school, my parents tucked a little treat into our lunches every day for my younger brother and me to enjoy. Since Mom rarely baked, we usually found store-bought sweets when we opened our lunch boxes. But our favorites were always Little Debbie sweets! We weren’t picky with the type. Oatmeal crème pies, cream-filled chocolate cupcakes, chocolate cake rolls with vanilla frosting… We slowly savored every single crumb of those treats! During December, Mom often snagged some of the holiday-themed sweets, like Little Debbie’s small cakes cut into the shape of Christmas trees and decorated with festive red and green sprinkles. If we behaved really well, she even let us each eat one as our after school snack! When I spotted a prominent display of those tree-shaped cakes at the grocery store last week, I smiled at the childhood memories of eating those as a special treat after returning home from school. 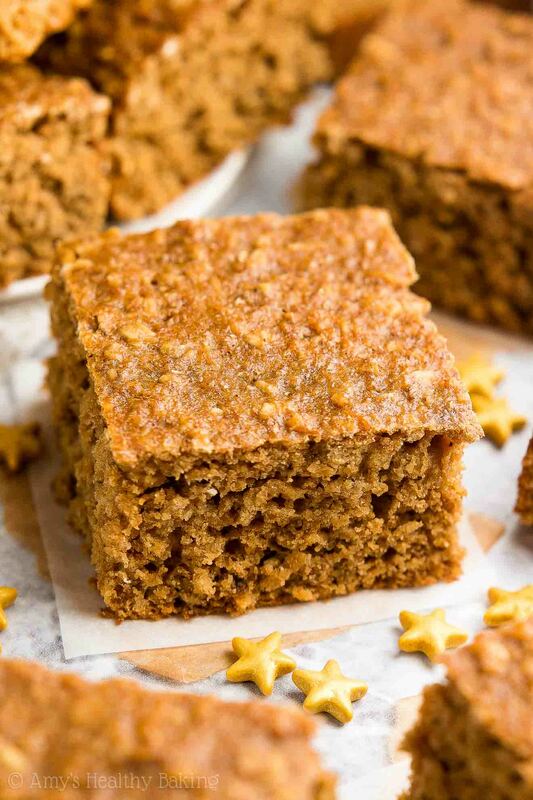 But I’m sure this Healthy Gingerbread Oatmeal Snack Cake would’ve been a much better—and even yummier—option! It’s bursting with festive and cozy holiday flavor, but it contains no artificial ingredients, refined flour or sugar like those store-bought cakes… And it’s only 101 calories! 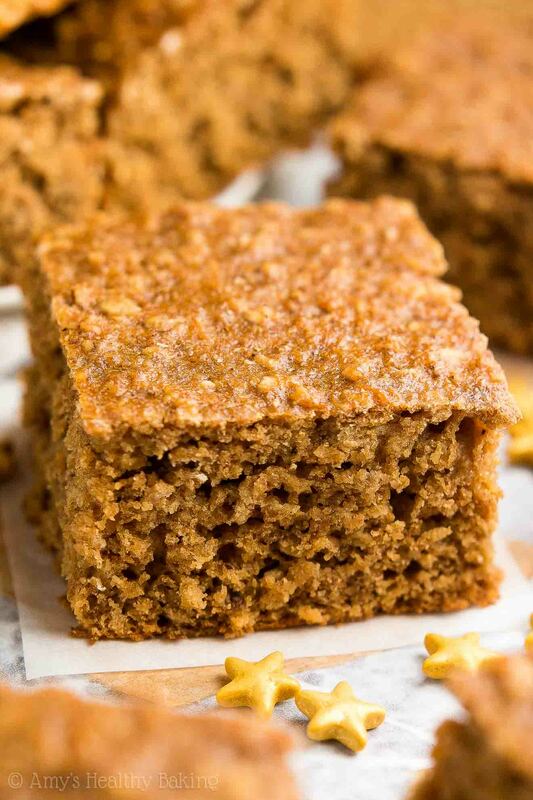 And since my brother and I have always been huge gingerbread fans, I bet we even would’ve picked this healthier snack cake over those store-bought ones as young kids! 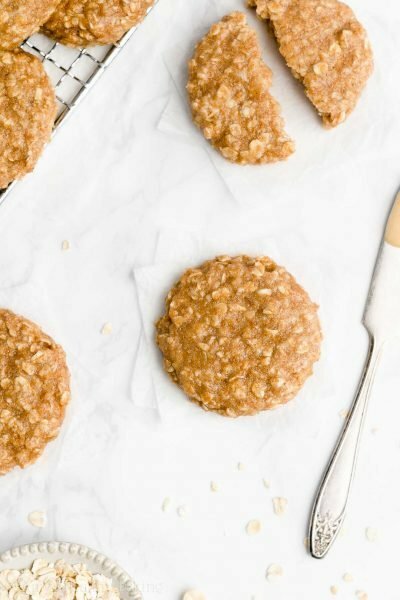 To make this healthy treat, you’ll start with whole wheat flour (or gluten-free, if you prefer!) and instant oats (like these… or these for a gluten-free option!). Instant oats are smaller and thinner than traditional rolled oats, so they give this cake a hearty yet supremely tender texture. 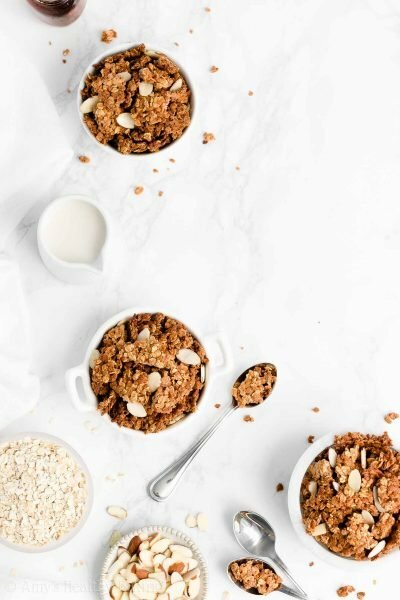 They’re also called “quick-cooking” or “one-minute” oats, and you can find them right next to the old-fashioned oats at the grocery store. To really boost the supremely tender texture, you’ll also mix lots of Greek yogurt into your cake batter! 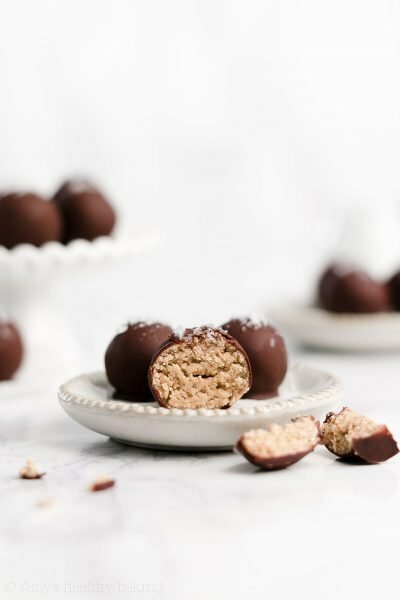 I bet you already knew I was going to say that, right?… It’s one of my favorite ingredients for a reason! It adds the same moisture as extra butter or oil for a fraction of the calories, and it gives your baked treats a protein punch, too! Snack time just might be my new favorite time of day! 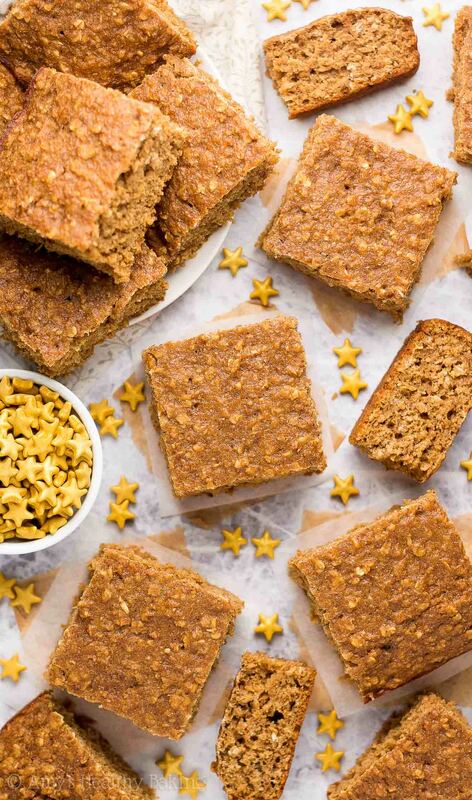 Or maybe breakfast… Since this snack cake is definitely healthy enough for that too! ? And when you make your own, remember to snap a picture and share it on Instagram using #amyshealthybaking and tagging @amyshealthybaking IN the photo itself! (That guarantees I’ll see your picture! ?) I’d love to see your snack cake and feature it in my Sunday Spotlight series! This recipe is perfect for holiday snacking—or even breakfasts! 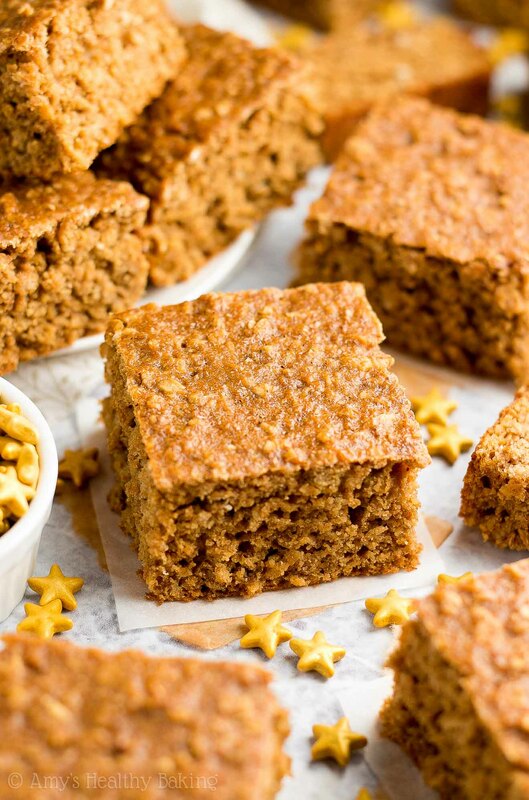 The snack cake is full of hearty oats, cozy spices, and rich gingerbread flavor. (Three of my favorite things!) Leftovers will keep for at least one week if stored in an airtight container in the refrigerator. Preheat the oven to 350°F, and coat a 9”-square pan with nonstick cooking spray. Spread the batter into the prepared pan. Bake at 350°F for 22-26 minutes or until the center feels firm to the touch and a toothpick inserted into the center comes out clean. Cool completely to room temperature in the pan before slicing and serving. For the gluten-free flour, I recommend the following blend: ¾ cup (90g) millet flour, ¼ cup (30g) tapioca flour, ¼ cup (30g) brown rice flour, and ½ teaspoon xanthan gum. Most store-bought gluten-free flour blends will work as well, if measured like this. White whole wheat flour, whole wheat pastry flour, or all-purpose flour may be substituted for the whole wheat flour. It’s extremely important to measure the flour and oats correctly, using this method or a kitchen scale (← that's the one I own and love!). 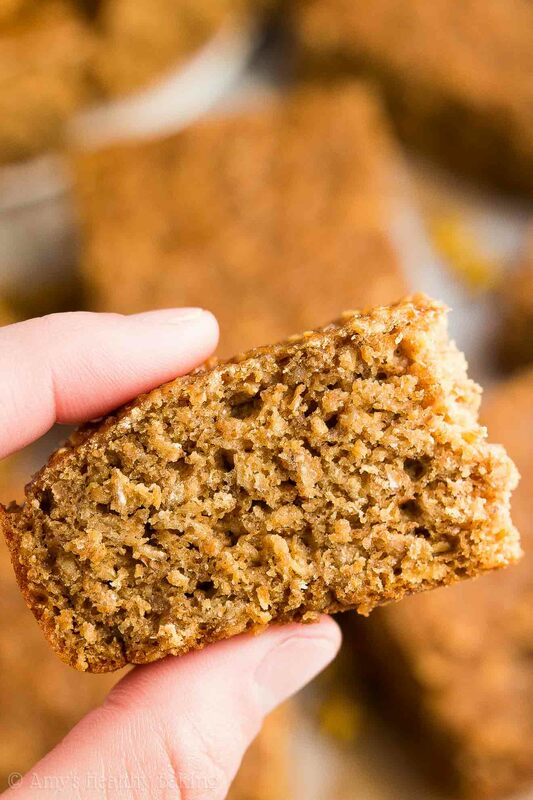 Too much of either will dry out your cake and give it a crumbly texture—especially the oats! They act like little sponges and soak up moisture from your cake batter. As written, this gingerbread loaf is on the spicy side. For a mellower spice flavor, decrease the ground ginger to 1 to 1 ½ tablespoons (5g to 8g). I do not recommend substituting anything for the molasses! Along with the ground ginger, it’s what creates the iconic gingerbread flavor: deep, complex, rich, and cozy. This is the kind that I use. It’s shelf-stable and keeps for ages, and you’ll use it in all of these recipes of mine, too! Honey or agave may be substituted for the pure maple syrup. Any milk may be substituted for the nonfat milk. For a sweeter flavor, increase the maple syrup by an additional 2 tablespoons (1/4 cup total), and decrease the milk by 2 tablespoons (6 tablespoons instead). Thank you so much Beverley! I’d love to hear what you think if you end up trying this snack cake! 🙂 Happy holidays, sweet friend! Do not appreciate having to scroll down thry picture after picture to get to the recipe, a mistake most online cookbooks do. Yum – these look amazing! Do you think I could use real ginger? I have a ton of it and I’d love to use it up asap, so if I could use it in this or anything else you might suggest, I’m all ears! Thanks Sarah! I haven’t tried using fresh ginger myself, so I’m really not sure. I’ve seen people say 1 tablespoon of fresh is about the same as ¼ teaspoon of dried… But that would mean 24 tablespoons, or 1 ½ cups, for this recipe. So I’m not sure that’s right! Maybe use a combination of fresh and dried? I’m sorry I’m not much help here — I just don’t want to lead you astray! 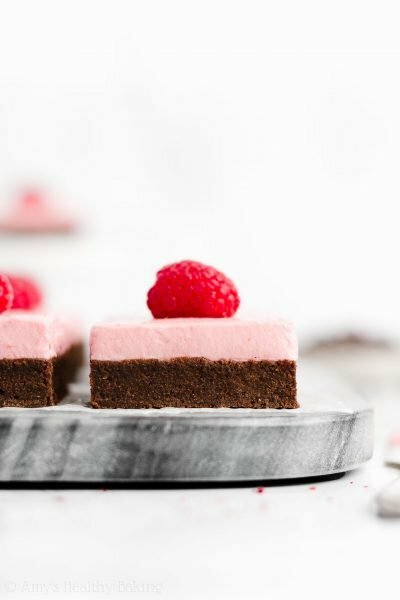 🙂 I’d love to hear what you think if you try this snack cake! I’m convinced holiday themed and SHAPED treats always taste better. For me it was always Reese’s. Granted, the recipe IS different for the holiday Reese’s, but still! Gingerbread makes me feel so warm and fuzzy inside. What does all spice contain? Allspice is actually a single spice — it just contains allspice and no other ingredients! It was given its name because it has flavor notes similar to a blend of spices, even though it’s just a single spice. Confusing, I know! 😉 I’d love to hear what you think if you try this snack cake, Nedaa! I cannot wait to try your healthy recipes! Am I able to substitute Splenda for Stevia in any of your recipes? Also, am I able to substitute Splenda or Stevia for honey in any of your recipes? My husband has a problem with honey and molasses, it’s a challenge to bake for him. I really appreciate your interest in my recipes Sheila! You’re so sweet to want to make homemade treats for your husband. He’s lucky to have you! It really depends on the recipe! So the best way for me to help you is if you leave individual comments on the recipes you’d wish to try. 🙂 Is this one of the recipes you’d like to modify for your husband? 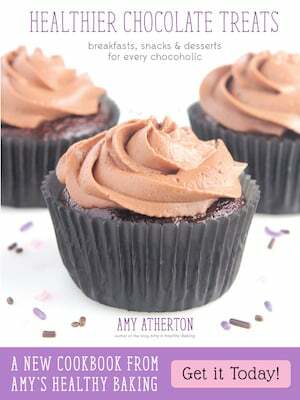 Hi Amy, I am going to make this one tonight! Will let you know how it turns out. I can hardly wait! And ohhhhhh…I just subscribed to your YT channel! I also liked the videos 🙂 You are doing awesome! Awwww thank you SO much for subscribing Carmelina!! I’m truly honored! (And maybe now you’ll have some new songs that you sing while baking?… ?) I’m excited to hear what you and your family think of this snack cake! 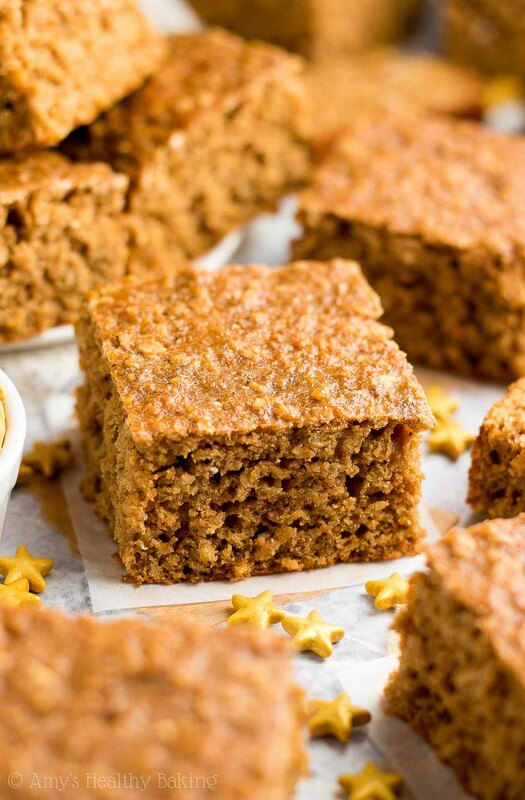 Hello Amy, I made this snack cake and…..you are right on the money when you say cozy spices! This cake is supreme! Sadly though….it’s only a 9″ pan so it’s all gone!!!!! Yup! It was thaaaat delicious! The texture was perfect! I think I will take a chance, double the recipe and use a 9×13 dish. No fault of your own if it doesn’t turn out as it should because I am choosing to alter the recipe somewhat. Will let you know how it turns out.Thank you!! 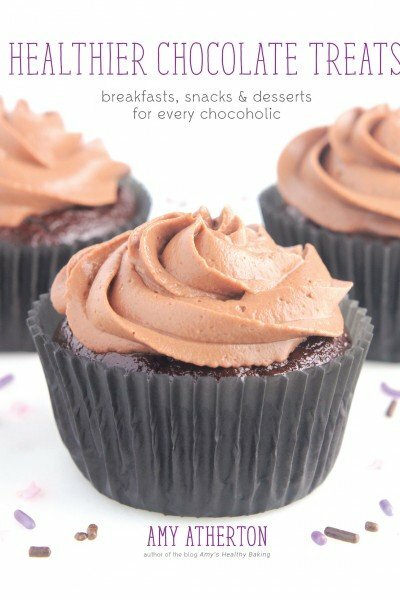 I just made this recipe but as muffins instead of a cake. I made several changes to the recipe, some on purpose, some by accident. I used rolled oats instead of instant because that’s what I had, organic unbleached all-purp flour instead of whole wheat, 2 whole eggs instead of just whites, didn’t have vanilla extract, 1/2 cup yogurt (I messed up LOL), and 1/4 cup of maple syrup (my ‘helper’ misread and forgot the molasses and read the maple syrup as 1/4 cup WHAT EVEN).